Today we’re fortunate to have guest blogger Joan Lambert Bailey writing for us again! Joan currently lives and writes in Tokyo where she is lucky enough to get her hands dirty at a local organic farm. You can read about her adventures learning about Japanese food from seed to harvest to table at Popcorn Homestead or join her on Twitter. It is the rare venture that can trace its beginning to Ecuador and a failed pot of miso. But that is exactly where Takashi Watanabe first found himself contemplating the unique qualities of his homeland, especially its food. Wanting to share some of those flavors and traditions, he attempted to make miso for friends met while traveling in South America. “I told them it’s delicious and doesn’t need refrigeration. Much of Japanese food, such as tsukemono and miso, is about keeping food fresh without refrigeration,” he said. Now, nearly ten years later, Watanbe is an organic farmer, father of three, and founder of Toziba, an innovative NPO focused on building community via farming and food. A self-described “former commuter,” he returned to Japan after a year of travel determined to create a place where people could connect with each other via work and learning while rediscovering their traditional food culture. Taking the organization’s name from the Japanese word tojiba – a place, usually a hot spring, where farmers would gather at the end of the day to talk and soak away the day’s labor – Toziba has grown from a single site in 2002 to twenty-five locations (down from a pre-March 11th high of thirty-five) scattered over the length and breadth of the country. Toziba’s main crop is daizu or soybeans. A fundamental ingredient for many of Japan’s most quintessential foods – soy sauce, tofu, and miso to name only a few – it is, according to Watanabe, remarkably simple to grow. While rice, Japan’s most beloved grain, requires an experienced hand and watchful eye, daizu‘s comparatively easy nature makes it possible to plant wherever there is room. And daizu is so beneficial. As a legume, daizu‘s nitrogen-fixing roots supplied adjacent rice fields a steady source of nutrients while stabilizing the soil. 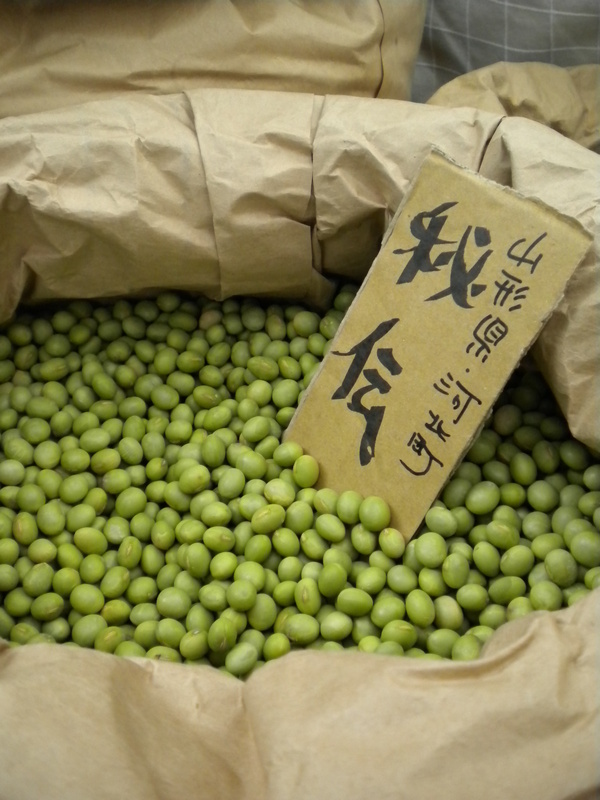 Growers would have feasted on young pods as edamame or mashed the first beans into a seasonal dessert called zunda. 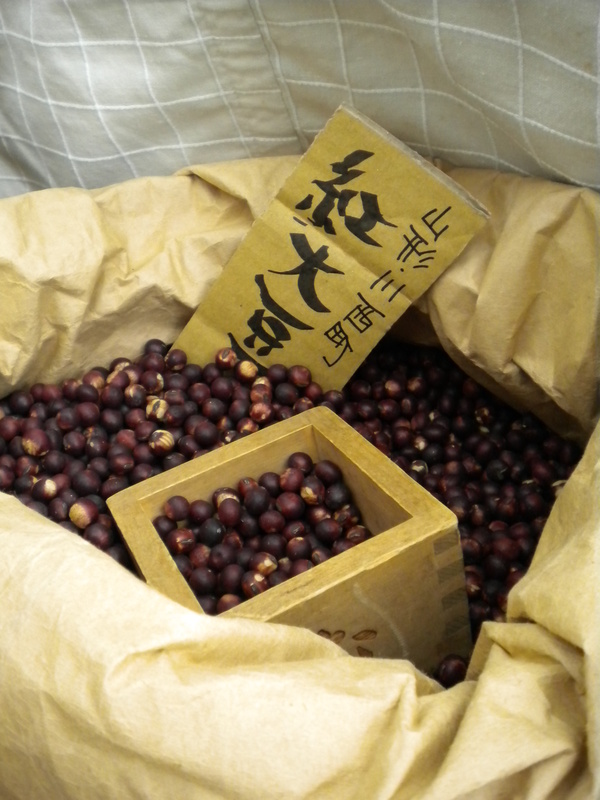 Dried beans would be stored for winter use or mixed with yeast and salt for miso. A selection of the strongest and tastiest would be set aside for planting the next year. Daizu and its powerful nutritional punch immediately became indispensable for both the table and the field. Focusing on heirlooms, too, is one homegrown solution to Japan’s current food security and self-sufficiency issues. Since daizu first arrived in Japan more than one thousand years ago, farmers cultivated varieties suited to their culinary preferences and regions. Pointing to a map of Japan, Watanabe offered an astounding bit of information: “In Japan, there are three hundred named varieties of daizu and two thousand varieties without names.” Currently, Japan raises only 3 to 5 percent of the soybeans it eats while the remainder are imported from the United States and Brazil. Toziba brings the majority of their heirlooms to life again in fallow fields owned by aging farmers. Members pay an annual fee of 5,000 yen for a share in a field and the season’s harvest. Regular events, including a class on handmade miso or temae miso, bring people together for work and play that Watanabe hopes will foster a movement to transform the current food system into something more local and sustainable. “I want to create people who actually plant daizu. When they see the bean they understand the problems with genetically modified (GM) foods. They understand the issues of import and export. They understand and think about these things when they see their own daizu growing. They realize it for themselves. It’s the best education,” he said. “The Daizu Revolution can be a trigger to change many things. They see the seed in their hand and they realize what’s happening and why nuclear power is bad. First, the daizu. Then the rest will come,” he said. Watanabe pointed out that since the March 11th triple disaster the Japanese consumer is more interested than ever in where their food comes from and the farmer growing it. Even now, a little more than eight months later contamination concerns remain paramount. Yet, he wondered, where was this curiosity and concern before the earthquake and nuclear disaster? “Genetically modified (GM) is an even bigger problem and even more dangerous,” he said. “The lack of crop and seed diversity, the patenting of plants and seeds in order to simply turn a profit is just as deadly as nuclear fallout,” he argued. Toziba collect seeds for their sites come from a range of sources, including Japan Agriculture (JA), a national farming cooperative; michi no eki – a highway rest area featuring all local, seasonal produce and products); and chokubaijjo’s (individual farm stands) often tended by an obaachan (old woman or grandmother) who knows the land and its crops as well as her own children. “The absolute best, though, is the obaachan at the chokubaijo. She tells how to plant the seed, what to watch for as it grows, why it’s unique, and why it was grown there,” said Watanabe. 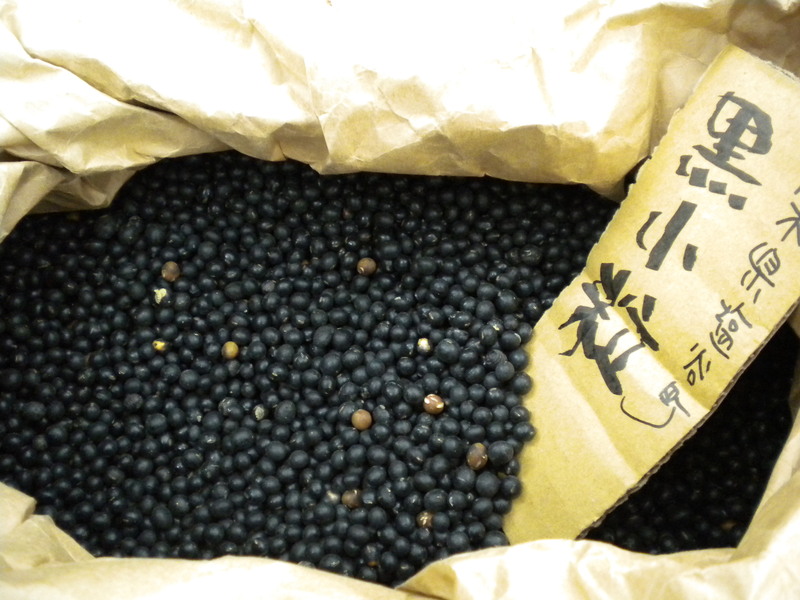 Watanabe’s own first seeds came from an organic farmer in Yamanashi Prefecture specializing in daizu. 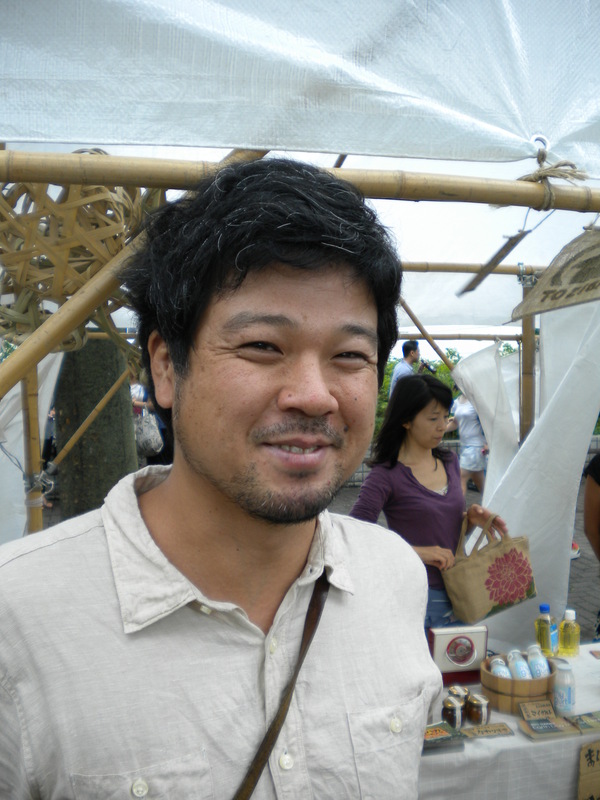 Once he learned Watanabe’s farm was located in Chiba, an agricultural region just north of Tokyo, he recommended a bean developed there and which is delicious to boot. Since setting those first seeds in the ground, Watanabe has never looked back. And like any grower, he is excited, worried, patient and impatient all at once. His final harvest, after all, is not just kilograms of beans, but of people transformed and maybe, ultimately, a new society. While Toziba’s official numbers are down at the moment, Watanabe remained upbeat. Before the earthquake and nuclear disaster, people were drawn to the organization and its ideals. Now, that same energy is gradually returning as people seek knowledge about their food and alternative sources for it. Growers displaced by the disaster are attempting to recover and rebuild in place or have relocated near other members of Toziba’s network to start over. And he noted that whether the total number of sites is twenty-five or thirty-five doesn’t really matter. As seeds are shared and planted, harvested and shared again, his dream is coming true. “It spreads from friend to friend who spread the seeds themselves to family. It’s difficult to say what the real total is. The map is probably more full, but I can’t say for sure. Which is the purpose. We won’t need the name Toziba in the future because we will just be doing it,” he said with a smile of pure pleasure. This entry was posted in On the Farm and tagged heirloom, japan, joan lambert bailey, miso, organic farming, Real Time Farms, soy beans, Takashi Watanabe, tofu. Bookmark the permalink.